I normally HATE salmon. I will always choose not to have it because it just never tastes good to me. I have been making my brother all of his Ultimate Reset Cleanse meals and eating them with him so I decided to try it again. 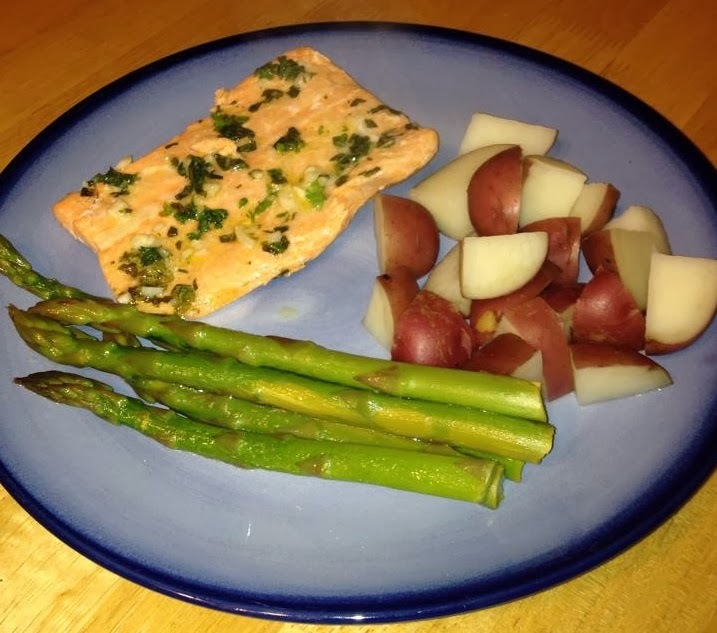 This recipe was the first time I ever liked eating salmon. I would actually pay money and order this in a restaurant. I will be making this recipe again that is for sure. SO GOOD! Combine garlic, oil, basil, salt, seasoning blend, lemon juice, and parsley in a small bowl; mix well. Place salmon in a shallow dish; pour marinade over salmon. Marinate for 20 minutes, turning once to get marinade on both sides. Preheat oven to 350 degrees F. Place salmon on a piece of aluminum foil. Cover with marinade; seal. Place sealed salmon on baking sheet. Bake 20 minutes, or until salmon flakes easily when tested with fork.